SECURYPTO – ENCRYPTED DATA TRANSFER & STORAGE. Securypto ICO is a Zerocoin, Masternode based blockchain project that focuses on anonymous storage and encryption. Market Incentives Increasing Income With Anonymity Distribution. Create emerging markets. Transfer or save encrypted messages and files that can not be found through the Internet. It is connected to an open security sheet for additional security layers. It is accomplished with the combination of specially designed hardware, software and block networks. Lack of reliable solution for anonymous messaging or data transfer. Complex protocols to secure or spend many different cryptocurrencies. DigiSafeGuard acts as a standalone hardware wallet and encrypter for all data. All hosted data is encrypted and thus nobody can know what they are hosting. Disabling the link between the uploader, downloader and hosting company. Securing the identity of all parties. It’s commonliy known that every software, even the one developed by the best in the field, will have bugs and flaws. Securypto takes the integrity of the project to the next level by designing a dedicated open source hardware for the tasks and combining itto a visual verifiable communication technigue which makes remote exploiting of vulnerabilities impossible. DigiSafeGuard acts as a hardware wallet for storing and spending your digital assets. It enables anonymous messaging through any unsecured channel. Also DSG offers a lot more of handful and awesome features. Securypto software is designed to make a weli-balanced system considering the aspect of user-friendliness, security & privacy. Highest security level can only be achieved by right combination of hardware and software which are specially designed to match each other’s functions. Thus, DigiSafeGuard is obviousiy the most secure solution when used with Securypto software and blockchain. Securypto will achieve all that with the power of the blockchain and a team of security tin foiled hat people supporting it. Blockchain technology has solved the “trust issue” as every data can now be verified without trusting any specific third party. Securypto blockchain adds an extra privacy layer on top of every function it offers and at the same time creates a Paid-Content-Management which enables its users to get rewarded for their uploaded content. Securely store and spend your digital assets like Bitcoin etc. using DSG device which will act as a hardware wallet. Securely send and receive messages and files using any open and insecure channel like WhatsApp, Telegram or email. Login securely to online services like Gmail, Facebook, Twitter, banks etc. Keep all your accounts and login credentials protected and encrypted on your DigiSafeGuard device. Encrypt any sensitive file or directory and keep them safe and secure. Easy to use for everyone, even if you don’t understand how encryption works. Users can use any insecure channel, even a compromised PC or Smartphone as every byte leaving DSG device will already be encrypted. Users don’t need to trust any third-party, not even the Securypto team to secure their cryptocurrency assets, as they can use any random / widely available services to create unsigned transaction for spending their cryptocurrencies and let the DigiSafeGuard sign the transaction. Users can use any publicly available crypto software to decıypt their files and messages as we use well known and documented public AES encryption protocol. Users can create, import, export and verify their own RSA key. Securypto uses blockchain technology to provide a transparent and trustworthy service to its users enabling them to have a secure place on the internet without any worry of privacy matters. Securypto system uses “POS” which is blockchain based technology where every node will function as a gateway to hosting facilities. This way users using small devices such as a Smartphone won’t need to run any full nodes. Full Nodes are ideally a VPS server having a 99% uptime and fast connections. Nodes use their own internal or other external storages. Securypto blockchain connects proxy with the masternodes to provide the anonymous facility in the platform. By using Blockchain in the securypto platform, Securypto has added an extra privacy layer on the top of all the features offered by the dedicated hardware (DSG) and the software. 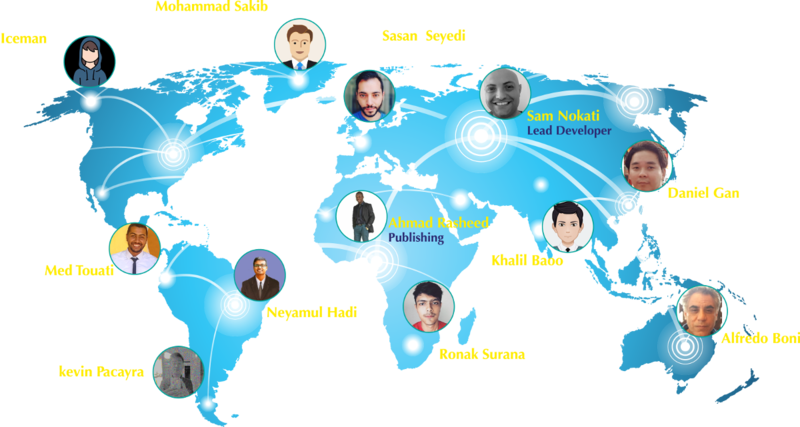 On the other hand, Securypto arranged a rewording system called Paid Content-Management which enables the users to get rewarded for their uploaded content and the hosts to get paid for their hosting facilities. 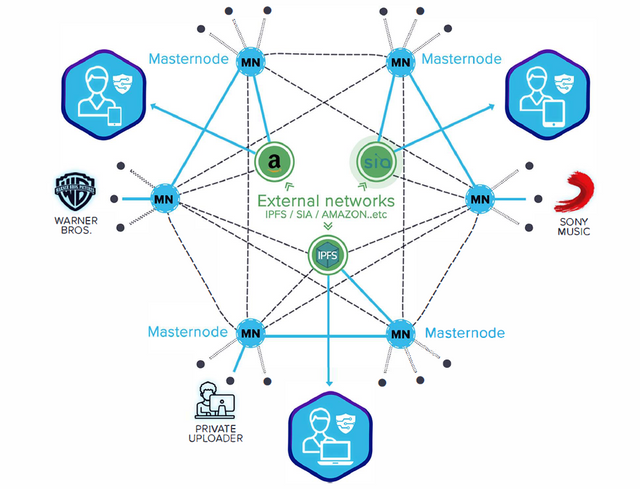 In the paid content management with the blockchain technology, Masternodes get paid by the uploaders. Content uploaders can choose to get paid by the downloads. Therefore, an emerging market for uploading new content to the network will develop. Masternodes include the file location and receiver’s public key on to the blockchain using an onion-based protocol like TOR network. The Sender and the Receiver can exchange keys without compromising their privacy. Full anonymity is finally here. SCU is an ERC-20 token based on a smart contract. SCU is a utility token that will function on the Securypto platform. SCU tokens are needed to transfer encrypted data anonymously on the securypto blockchain platform and monetize content distribution. After switching from TestNet to MainNet, the SCU token will be exchanged for SCU coins at the Securypto MainNet Blockchain. The total supply of SCU tokens is one hundred million (100,000,000). Securypto isn’t just regarding obtaining a few excellent designers collectively and begin composing rules, however derives the woman’s power from the varied group associated with expert people with various abilities upon numerous topics comming collectively to show an excellent idea to some globe altering task. From Securypto all of us think that the actual advertising team or even the actual equipment technical engineers tend to be because essential because the blockchain designers or even protection specialists and something can’t be successful without having an additional.